We are so happy we made the choice to send our child to OJCS! The staff truly cares about each and every child in the school and will bend over backwards if there is any issue, big or small. The curriculum is fantastic and I love that they balance education with community involvement and Tikkun Olam. Our child is thriving at OJCS and I look forward to our younger child joining the OJCS family (and it truly is a family!) next year. Great school. Very happy as a first year parent. ...very happy as a first year parent. OJCS is a wonderful place on so many levels. As a former OJCS teacher, the current PTA president and an OJCS parent, I have an unique perspective on the school. Over the last couple years I have watched the school go through an amazing transformation. When you walk through the halls the excitement for learning, from both the students and the teachers, is almost palpable. There is a sense of family and ruach that resonates through the halls. Every morning my children and I discuss what they are most excited about that day and every day I have to limit the list because otherwise we would not have time for everyone to share. I feel very fortunate to part of the OJCS family and am proud to say that my children are OJCS students. Such a great siddur party! It really showed what the kids are learning and showed me how much more self-confidence my daughter has and how much she's blossomed this year. I can't imagine her a year ago speaking the opening line in front of strangers; but she did it today so easily. We knew that switching schools was the right decision. But now we've seen first-hand just how much of a difference OJCS has made in her. Kol hakavod! 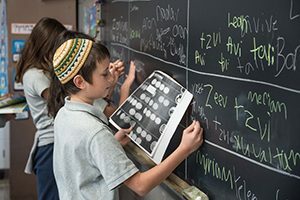 Having two children who attended Hillel Academy [now OJCS] we are still amazed at how much knowledge they received on the history of Judaism, Hebrew linguistics and a love of Israeli song and dance. Thanks to the diverse backgrounds of the faculty they received excellent schooling in both English, and French, along with their Jewish studies, of which we as parents are still very proud. 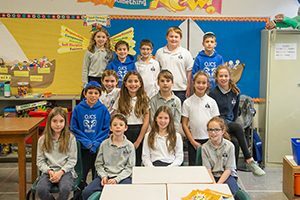 But most importantly are the long lasting friendships and strong identities as responsible, Jewish Canadians both our children developed during their time at school. I feel the best gift Jewish parents can give their children is the gift of Jewish education. Times are tough, but I know I will not regret the investment I have made in my children's future. OJCS offers my children the best possible education. My children learn about their heritage in a nurturing environment while still getting the highest quality secular education. OJCS was the right choice for our family. A warm and haimish place to learn and grow up. It is at Hillel Academy and from my teachers that I fell in love with Israel and the Hebrew language. My trilingual education helped make me what I am today. 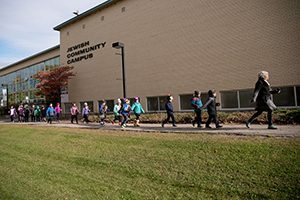 I have always attributed my personal connection with the Jewish community to my 11 years at OJCS. As a graduate of Hillel Academy [now OJCS], I value the importance of growing up with a Jewish education and being in a Jewish environment. 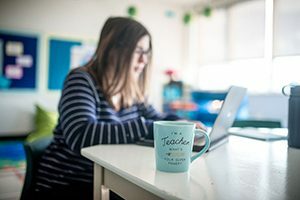 As a brand new teacher, I had many different career paths available; the public school board, a private school, and of course a Jewish day school. Being in OJCS on Yom Ha'atzmaut is what lit up the only path that I was interested in pursuing. Seeing the students' ruach and watching them celebrate Israel's independence reminded me why I love Jewish education and why I feel Jewish education is the greatest gift we can give our children. I feel blessed and honoured to have the opportunity to teach the future leaders of our community! OJCS was like a second home providing a safe and stable environment for my child’s learning and development. Through excellent learning opportunities in three languages (English, French and Hebrew), highly trained educators, state of the art technology and small class sizes, OJCS continued to exceed my expectations and prepared my child for high school and beyond. In addition to a high quality education, my child was shown the warmth of our diverse Jewish Community and his role in continuing to develop his place as a Jewish Leader and community member. I am a parent of three children who are students at OJCS. Our kids have all thrived at school academically and socially. As parents we love the community that they get to be a part of and the small class sizes that allow learning to be tailored to their needs. Our recent trip to Israel showed us how connected they feel to the country, the language and the history of our culture. We could not imagine a better environment for them to grown up in. 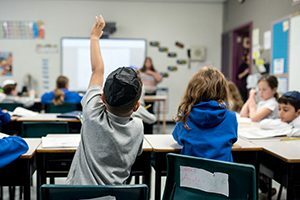 Enrolling your child at Ottawa Jewish Community School is one of the best decisions you will ever make for their future. Contact us today for enrolment opportunities.